Abojeb Group, one of the leading maritime and manpower services companies, inaugurated its new office in Paranaque City last November 28 (Wednesday). Managing Director of Abojeb Carl Martin Faannessen talks about the company’s continued leadership in the maritime and manpower industry and its commitment to continue bringing opportunities to Filipinos. 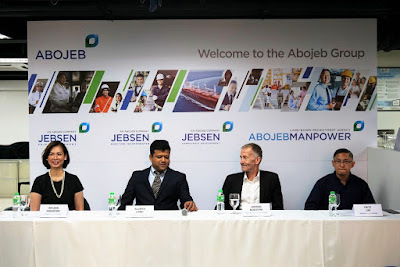 Senior Vice President for Crewing of Jebsen Maritime Arleen Asuncion shares how Abojeb’s crew management arm differentiates itself through market-leading tech innovations and welfare programs. Faannessen also mentioned that though Abojeb Group will remain focused on recruiting and developing Filipinos seafarers and providing quality and cost-efficient ship management globally, they are also looking at hiring land-based professionals because of the global demand for Filipino talent in the healthcare and education sector. Head of Jebsen Ship Management Capt. Allwyn Lobo expounds on the advantages of operating ship management from the Philippines and the country’s promising position to lead in the said field. General Manager of Jebsen Competency Development Center Capt. Joeran Noestvik shares the company’s take on skills development of Filipino seafarers including career progression to remain a competitive source of maritime talent. Business Development Manager of Abojeb Manpower Solutions Fritz Lim gives a primer on the land-based manpower recruitment unit of the Abojeb group which is active in the healthcare, oil and gas, ship building, and engineering industries. (L-R) Abojeb shareholders: Endika Aboitiz, IMO Ambassador Carlos Salinas, and Bjorn Jebsen share the stage for the inauguration ceremony.